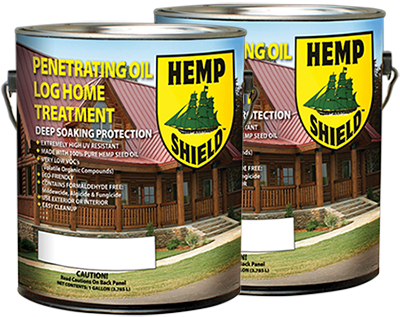 Hemp Shield™ — The First Hemp Seed Oil Containing Wood Finish & Deck Sealer For All Wood Products and Hemp Shield Log Home Treatment™— Ultra low Toxicity, Eco-Friendly. Hemp Shield is a proud manufacturer of the first hemp seed oil containing Wood Finish & Deck Sealer for all wooden products along with Hemp Shield Log Home Treatment™ (specific to log homes). Our wood finishes/sealers/treatment are UV resistant and can stand harsh weather conditions. Hemp Shield's ultra low toxicity and environmental friendliness ensure that your outdoor wood will look new and natural for years. The hemp seed oil molecules in Hemp Shield products are smaller than most oils used in coatings allowing for both better penetration of the wood while inducing increased synergy between all the other components in our proprietary formulas. Hemp Shield, manufacturers of hemp based construction materials, is proud to announce the market release of Hemp Shield Wood Finish and Deck Sealer™ and Hemp Shield Log Home Treatment™ — The first and only penetrating wood finish containing 100% hemp oil that is produced in the United States. Hemp Shield™ is suitable for wooden decks, fences, stairs, siding, shutters, furniture — anything wooden that is exposed to the weather. In extensive tests, Hemp Shield™ outlasted other comers, including the highest priced deck finish on the national market. Hemp Shield's finish is extremely UV resistant, and the trans-oxide pigments used in shaded varieties of Hemp Shield™ provide long lasting color to your outdoor wood that does not hide the grain. Hemp Shield's unique hemp oil formulation represents a major advance in preservation of outdoor wood — a back-to-the-future choice that, by reviving use of an agriculture based oil feed stock, has created a sustainable, Environmentally friendly with ultra low toxicity- Hemp Shield Wood Finish and Deck Sealer™ and Hemp Shield Log Home Treatment™ offer superior performance in a truly 'green' waterproofer and protectant for outdoor wood, and can also be used indoors too as there are no Hazardous Air Pollutants (HAP’s) and no fumes. Hemp Shield Wood Finish and Deck Sealer™ and Hemp Shield Log home Treatment™ were tested in an Accelerated Weathering Chamber (ASTM D 4587), where it out-lasted other competitors, including Thompsons Water Seal™ and Cabot’s Deck Stain™. Hemp Shield Wood Finish and Deck Sealer™ will keep your outdoor wood looking new and natural as long as possible. Hemp Shield Wood Finish and Deck Sealer™ is unlocking the properties of hemp oil to offer significant improvements in finishes for exterior wood. This natural seed oil is much more readily accepted into wood fiber than other plant or petroleum sourced oils.